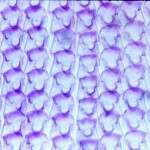 The radula is equivalent to a serrated, toothed ‘tongue’ used by molluscs (except the bivalves which lack this structure) for feeding. 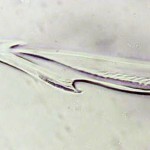 This chitinous ribbon, resembling a flexible and renewable file, is finely toothed and capable of cutting food and scraping surfaces to obtain food. 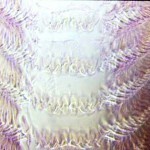 Worn teeth are replaced as they wear. 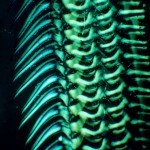 Each species has its own unique arrangement and form teeth. 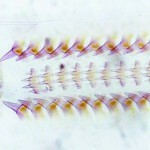 Here is a selection of images of slides of mollusc radulae (‘tongues’) prepared in the 1930’s and taken from the the extensive microscope slide collection of Brighton’s Booth Museum of Natural History. 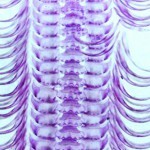 Radula spine of a species of Conus, barbed and grooved, designed to embed in its victim’s flesh and deliver a fatal dose of paralyzing poison. 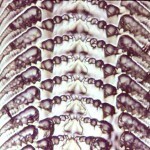 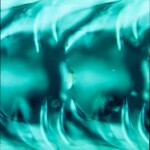 Unidentified radula in polarised light.